1 Georgia Genealogical Magazine, April 1964, Vol. 12, pp. 748-749. 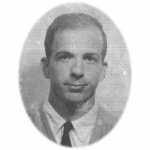 2 Cahill, Michael P., "Pedigree of an Assassin: Lee Harvey Oswald", StageClick: Theater for everyone (originally published La Plume de NOM, 1991), http://www.stageclick.com/topic/2968.aspx, (accessed 01/02/2012). 5 Wilson, Caroline Price, Annals of Georgia, Vidalia, Georgia: Georgia Genealogical Reprints (1969), 33, 51, 80, Heritage Quest (Digital Library).